Lester Gurnett was diagnosed with COPD and has been struggling over the past three years. He had one Stem Cell treatment but needs at least three more treatments for the transplant to have any positive effect on his disease. The sooner he receives a series of transplants the better his prognosis will be. The treatments are very costly and the go fund me is sorely needed for Lesters future life. Those of you who know Lester, know that he is a one of a kind cowboy who has always been there for those in need. Now this amazing cowboy is the one in need and we will all step up for him. Rodeo has always been a close knit family and our hope is this family will come through for Lester, as this is an urgent situation. 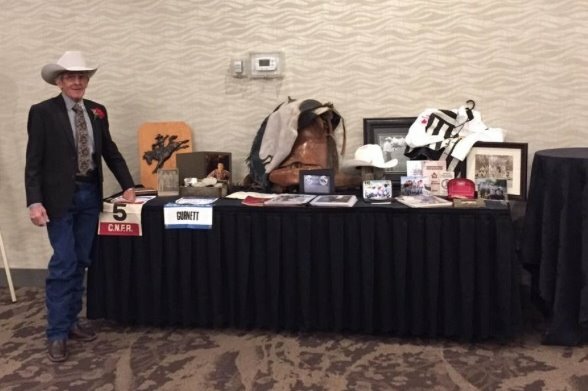 The Calgary Stockyards, Sue & Don Danard, Judi Wilson, & Annette Smith have teamed up for the Go Fund Me in hopes this will aid Lester in receiving the most needed Stem Cell Transplants. I have been in contact with the GoFundMe staff with the concerns that when donors make a donation, they are asked to give extra, believing that doing so means their entire donation will go to Lester. Although the extra is completely optional, it is misleading. As I stated in a previous update, 2.9% plus .30 cents are taken from the donation with the remaining going to Lester. I complained to them that it misleads the donor and was informed that if the donor would contact them via their receipt they would be refunded the amount given above their donation. In saying that, the GoFundMe vehicle has been AMAZING for Lesters Life and thanks goes to all of you who have made it possible for Lester to continue his stem cell treatments. FEB. 28 is his next treatment, but talking to him on Thursday he seems so much better than he was, so ITS WORKING!! We still have to insure that he receives 3 more stem cell treatments after Feb 28, so keep your donations coming. THANK YOU SO VERY MUCH. Just a note to let you know that Lester has been receiving a cheques from me everytime GoFundMe has deposited them to my account. Lester has been able to make another appointment for his stem cell treatment on Feb 28, due to your generous donations. Lester has been a good friend of mine as long as I can remember and this has been so rewarding to be able to help him reach his goal of survival. GoFundMe has asked that I report the above to you to continue the deposit of your donations to me so I can continue to give Lester your donations. Thank you and please continue your support as we are so close. I have been asked about the fees that GoFundMe charges. 2.9% of the donation plus .30cents. If you add any amount that goes to GoFundMe that is not included in the donation but goes directly to GoFundMe as a donation to them. It is ENTIRELY OPTIONAL for a donor to add to the actual donation to Lester. I hope this clears up any questions. Thanks to all of you, including MOLLY the long horn cow, Lester is going for his second stem cell transplant in Kalispel, MT on Feb 28. Good luck Lester and we are keeping the GoFundMe going for you until all of your transplants are complete. Watch GLOBAL TV CALGARY news at 5, 6, 11 on Feb 12 & 13 for Lesters push for life with GoFundMe.